Rinnai gas fired continuous flow hot water and heating systems have been specified for use at a leading fitness centre in Maidstone, Kent, replacing an old thermal store configuration. The site houses gyms, class studios, swimming pool, bar and café plus changing and showering facilities. The site, one of the busiest gyms and sports complex in the South East, had been served by an old stored hot water heating system housed in a plant room accessible only via a gantry. 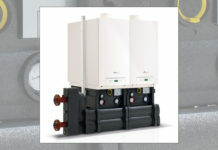 Rinnai proposed three x 1500e continuous flow hot water heating units cascaded to cope with the high demands. But the most important point for the site was that the Rinnai units could be installed externally to the space starved plant room, resulting in a freeing up of space and heavily reducing additional expenditure for the additional remedial works that would have been required if the site chose to replace ‘like for like’. This would have required the hiring of cranes and demolition work. The installation was characterised as being ‘straightforward’ and in a matter of days fully operational. 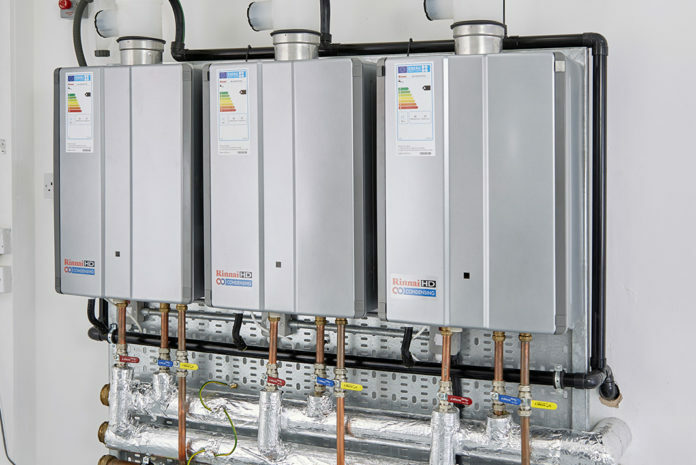 The three Rinnai 1500e units deliver almost 3,000 litres of hot water per hour – that is almost 40% more than the previous system – and uses around 42% less fuel, which is mains gas in this case. 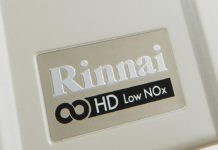 The Rinnai configuration also modulates to the working day. 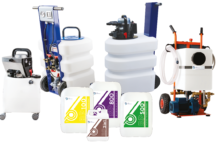 Contractor, Scott Combustion, chose the Rinnai 1500e units for a variety of reasons: reliable and continuous flow of useable hot water, safe temperature water distribution at all tap and shower points, overall energy efficiency and ease of installation plus minimal ongoing maintenance costs.